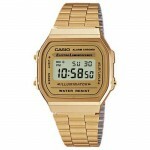 Hello everyone, today I thought it would be fun to take a look at some of the most popular styles of 80s Casio digital watches currently available. I appreciate it’s only a small list today, but I still think I managed to showcase a great example of what’s available right now. 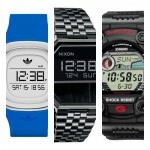 Note that these are all unisex watches that would be suitable for everyone in my opinion. For the most part I didn’t want to keep going over the same ground. Which is why I skipped out certain makes that really do overlap a lot in terms of looks and features with subtle variations etc. I’ve still included the classic F-91 in black as well as the PVD gold retro Casio watch I’m sure everyone will recognise. If you have any questions about any of the watches featured in today’s list, please do just comment below and I’ll be happy to try and help as soon as I can. 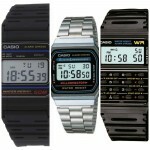 For now, enjoy today’s list of this vintage digital watches from Casio. 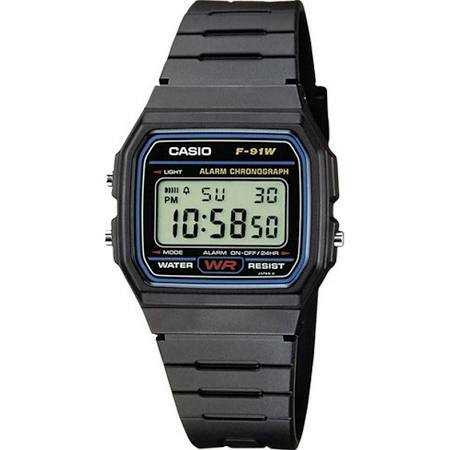 First up in our list of the best 80s Casio digital watches is the F-91. This watch comes in a variety of colours so if plain black isn’t quite your thing, you could always pick out a vibrant yellow version or something entirely different. This is an affordable retro Casio watch that’s built with a 37mm plastic/resin casing that has a thickness of 9mm. The strap is made of rubber and fastens with a buckle style clasp. You get a very decent watch for the money in my opinion. The digital LCD screen show information from the various features included with the watch. These include a daily alarm, hourly time signal, auto calendar, stopwatch, and a backlight. This retro 80s Casio digital watch is powered by a reliable Japanese quartz movement and has a water resistance rating of 30m. You can read my full Casio F-91 review here. 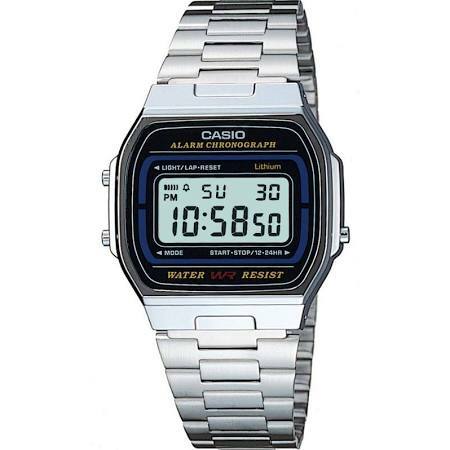 Next up in our list of the most popular 80s Casio digital watches is this unisex alarm timepiece. This retro design comes in a 35mm stainless steel casing with a chromed resin rectangular case. The thickness of this casing is approximately 9mm. The band of this Casio retro watch is made of stainless steel and fastens with a fold over style clasp. The dial is protected by a shatter resistant acrylic window lens and houses the LCD easy to read screen. Features of this watch include an alarm, chronograph, backlight and date function. It’s powered by a reliable quartz movement for accurate timekeeping. It also has a basic 30m water resistance rating. You can read my full 80s Casio digital watch A168W-1 review here. 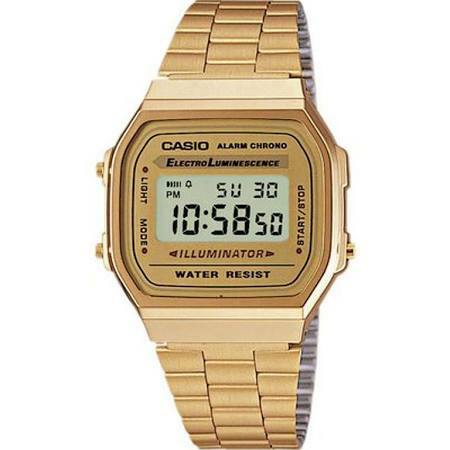 Here we have another affordable retro digital watch from Casio. This model is built is a resin casing that has a diameter of 34mm and a thickness of 9mm. The strap that’s been paired with it is also made of resin and fastens with a buckle style clasp. An acrylic shatter resistant lens protects the retro digital display of this watch. Features of it include a alarm function, stop watch, date display, and a back light. This men’s 1980s digital watch is powered by a quartz movement that gives you reliable and accurate timekeeping. It even includes a 50m water resistance rating which is great to see. You can read my full W59-1V Casio vintage digital watch review here soon. 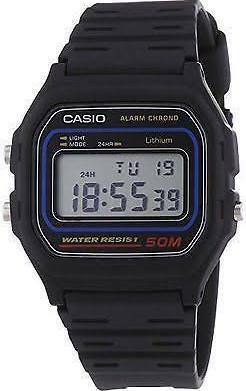 This is one of the most popular 1980s digital watches by Casio. This gold PVD plated finish to the watch has proved a big hit lately. The casing if made of stainless steel that’s PVD gold plated and has a diameter of 35mm. The thickness of the casing is approximately 9mm. It paired up with a PVD gold plated stainless steel strap that fastens with a jewellery style clasp. It features a retro digital watch display that’s made with an LCD screen and protected by an acrylic shatter resistant window lens. Features of this Casio reto men’s watch include a daily alarm, stopwatch, illuminated display, and an automatic calendar. 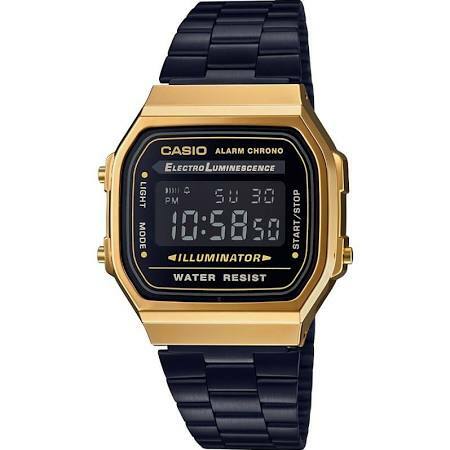 This retro Casio watch is powered by a reliable Japanese made quartz movement for accurate timekeeping. It also has a basic 30m water resistance rating. You can read my full A168WG-9EF 80s Casio digital watch review here. 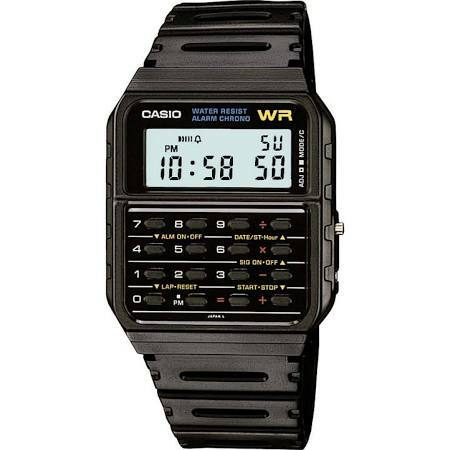 In at number 5 on our list of the best 80s Casio digital watches is the Iconic calculator Casio watch. I’m pretty sure most people have the general gist of what this timepiece does. It’s built with a 34mm plastic/resin casing that has a thickness of 8mm. The strap is made of a plastic/resin too and fastens with a buckle style clasp. On the front of the watch you’ll find an LCD screen and calculator buttons to operate it. The calculator function can display up to 8 digits. Extra functions of this watch include a dual time, alarm, stopwatch, and a hourly time signal. It’s powered by a Japanese quartz movement for reliable and accurate timekeeping. It also has a 30m water resistance rating. You can read my full CA-53W-1ER vintage Casio watches review here soon. This is the final timepiece to feature on our list of the most popular 80s Casio digital watches. This is a Unisex retro watch that’s built with a bit more of a modern look. That’s actually why it’s last on today’s list, It doesn’t have the same retro Casio look that people are used too, but it’s kept to the overall style in my opinion. This unisex Casio Classic Leisure is built with a PVD gold plated casing that has a diameter of 34mm and a thickness of 10mm. It comes with a black coloured metal strap that fastens with a jewellery style clasp. On the front we have a retro digital LCD display that’s protected by an acrylic window lens. Features of this watch include a date function, alarm, stopwatch, chronograph, and illuminator back light. This men’s retro digital watch is powered by a Japanese quartz movement that makes this an accurate and reliable timepiece. You can read my full A168WEGB-1BEF Casio retro digital watch review here soon. 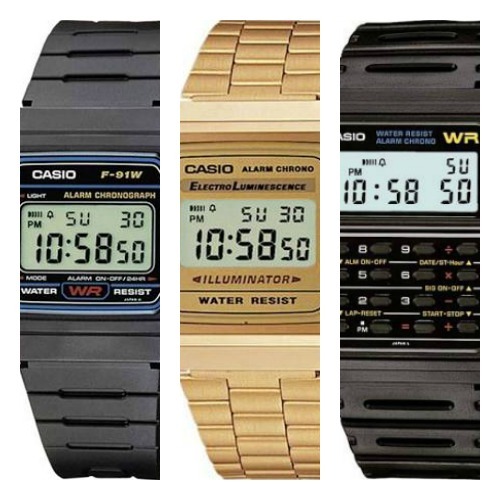 As always, thanks for taking the time to read through today’s list of the top 80s Casio digital watches. What was your favourite timepiece featured in today’s list? Comment below and let me know.